Let’s all say hello to dates. It has a funny name for a fruit, but with strong benefits. I bet many of you will meet with Dates for the first time. Let’s talk about this fruit and see if we can use its benefits. It’s fully packed with fiber. This means only one thing: improving digestion! Your body won’t have any problems digesting the food you take. You just need to include this powerful fruit in it. Dates is extremely sweet. This comes from the high natural sugar content. It is a great replacement for ordinary sugar. It is here to satisfy your hunger and can be easily digested. Your metabolism will thank you for eating this fruit. Now, let’s pay attention to its benefits. Dates are recognizable as the treatment weapon for anemia. The iron levels in it allows it to be really effective in this. 100g dates contain approximately 0.90g Iron. This is 11% of the recommended daily intake. Teenagers and pregnant women are the groups that need more iron. Dates largely contain lutein and zeaxantine. Both of them are considered as eye vitamins. These vitamins are highly beneficial for the eye retina and macula. 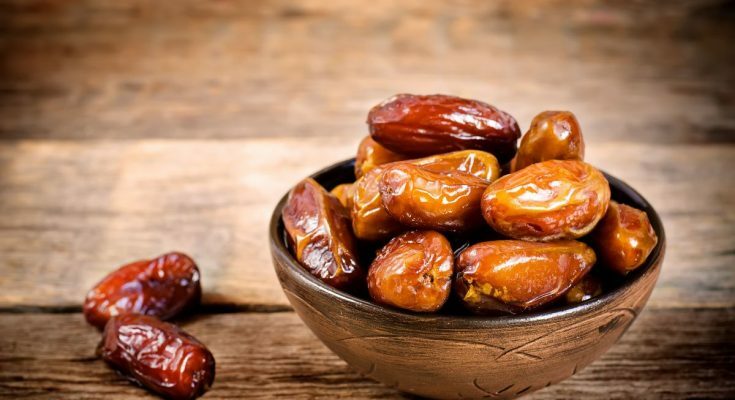 If you want to hold on to your sight or improve it, you need to eat more dates! There is calcium in dates. I don’t know if you heard about it, but calcium is important for diarrhea treatment. What’s more, dates does wonders for the renewal of the gut flora. 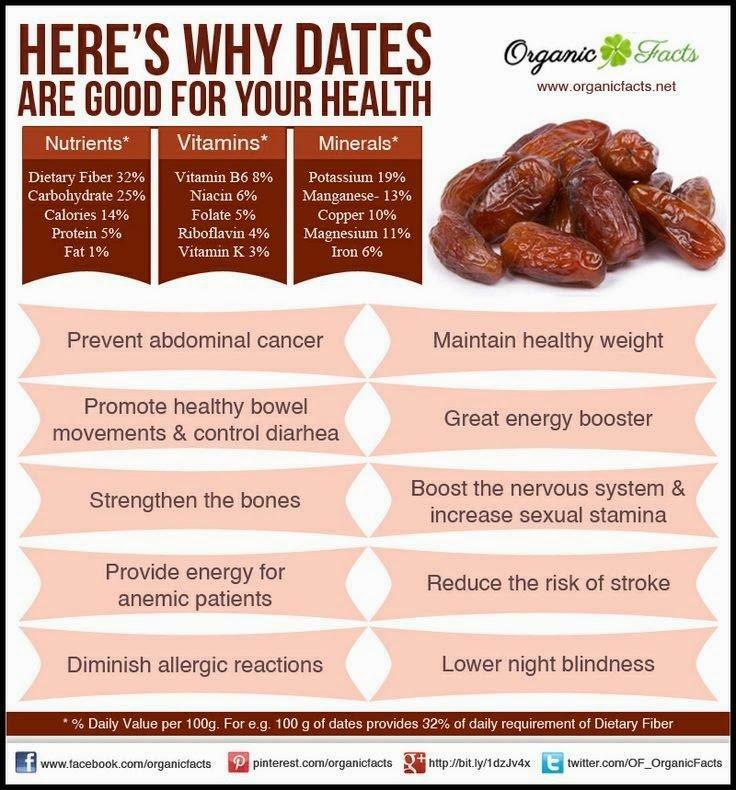 As I said earlier, dates stimulates better digestion. It does a great job eliminating all the toxins from the body. The high fiber content does this to your metabolism. It makes it stronger and resistant. By eating 100g of dates, you will enjoy 8.5g of fiber. This is explained in an experiment conducted at the Jordan University for Science and Technology. They have tested the effects of dates. If you consume dates on a regular basis 4 weeks before the due date, it can alleviate pain and reduce the bleeding. The study showed that all of the women who consume dates had much easier delivery than those who didn’t eat this fruit. Dates make you feel full. By consuming dates on a daily basis you will never get hungry again. This is a result of the many nutrients in this fruit. Please have in mind that overeating could lead to weight gain. Dates contain plenty of natural sugar that could transform in fat. 1kg dates contain approximately 3,000 calories. This fruit does a really great job improving your heart condition. People with weak heart are highly advised to consume dates regularly. Leave dates in a glass of water and in the morning blend them with the water together. You can drink this couple of times during the day. As you can see dates are highly beneficial. 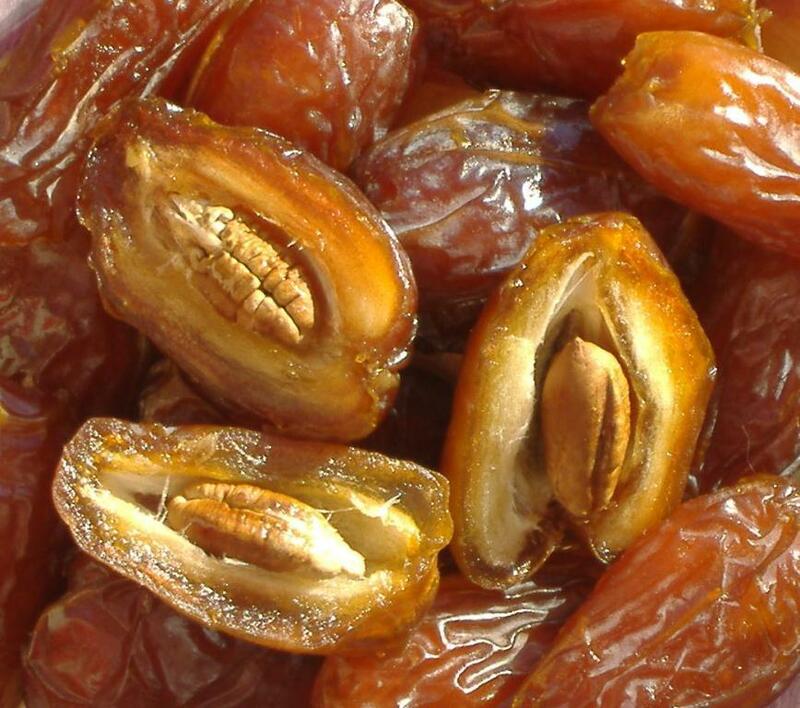 If you explore dates you will find that they contain little sodium, but rich in calcium. A serving of 5-6 dates contain 80mg magnesium. This mineral is really needed if you want to have good blood vessel dilatation. Dates is high in potassium. The fruit as a whole makes your body and nervous system stronger and more resistant. According to several studies, consuming 400mg of potassium a day lowers the risk of stroke by 40%. The fruit that does it all. If you combine dates and milk you are on the right track. Increasing the natural sugars in your body means more energy. The glucose, fructose and sucrose levels will all increase as you start consuming this fruit. I’ll say it again. Regulate the dates intake. The high dose of sugar could harm your body. Here is another libido booster for you. Do you remember this post where I shared libido booster foods? Now I can add it to that list. Put a few dates and goat milk in a glass and leave it overnight. In the morning, add some raw honey and cardamom. Drink it. The combination will get you going. It strengthens the body and increases your energy! Dates is the next Chuck Norris when it comes to fruits. It’s highly beneficial and you and your friends will love it. While we are talking about your friends, do you think they deserve to know about this powerful fruit?